Subjective question this week – the answer that we like best will win. Here’s the question: What is wrong with FOX? 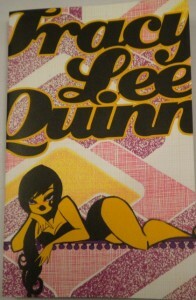 If your answer is selected, you’ll win an art booklet by the beautiful Tracy Lee Quinn. This will be open until next week’s show! Tune in next week to find out who wins. This is a complex question because FOX is an awesome station. As per wikipedia, the Fox Broadcasting Company (FBC), commonly referred to as Fox (often stylized FOX), is an American television network owned by Fox Entertainment Group, part of Rupert Murdoch’s News Corporation. Launched on October 9, 1986, from 2004 to 2009 Fox was the highest-rated broadcast network in the 18–49 demographic. To be the highest rated network they have to be doing something right. Overall i think that fox is still trying to find itself. When it launched it was edgy and hip, it aired shows that were crude and nothing like it was on other channels. They carried themself with shows like Married with Children and got their golden ticket with The Simpsons. While they stay on top of the rankings, it doesnt really seem like fox has defined itself with any new shows. The Simpsons is getting old and has to die in the near future, and contestant shows are cyclical. I think fox is purely looking for a show to start grooming into the next foundation of the network. was anything ever right with FOX? Fox genuinely doesn’t care about story. (Whedon does a nice bit on Fox and why Firefly was canceled in the special features of the Firefly DVD’s) They want eyes on the screen fast and don’t really care about story arcs that take half a season. Fox is the fast food of tv and news networks. Therefore I am guessing that makes NBC the In-N-Out Burger of the television industry? What’s Wrong With Fox? Politics aside, not much. Fox is the channel that gave us the X-Files, a show that revived science fiction in the 1990s. They have also given us shows like Firefly, The Sarah Connor Chronicles, and Dollhouse. Yes, the latter three shows failed, but if they had more veiwers they would still be on the air. Fox could have cancelled Dollhouse after one season; they didn’t, which even surprised Whedon. Since Fox was willing to give Dollhouse a second season chance, I think a more appropriate questions is, What’s wrong with Sci-Fi Fans?